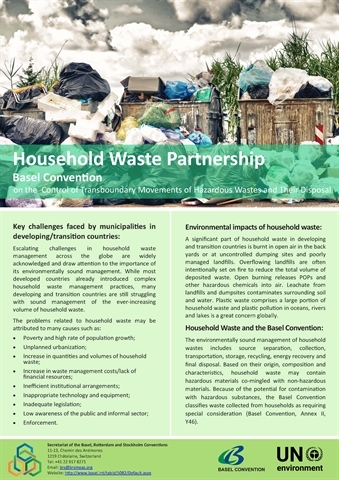 One of the key challenges related to waste management faced by national governments and municipalities, particularly in developing countries, countries with economies in transition and small island development states (SIDS), is the implementation of an integrated approach for the environmentally sound management for household wastes. This includes approaches which aim at avoiding or minimizing the generation of household waste at source as well as the development of integrated concepts, as relevant, for collection, separation, transport, storage, treatment, processing, recycling and disposal of household waste. The volume of household waste in many countries is increasing while its composition is permanently changing. Based on their origin and/or composition and their characteristics, household waste may contain hazardous materials co-mingled with non-hazardous materials. Because of the potential for contamination with hazardous substances, waste collected from households is classified under the Basel Convention as requiring special consideration (Basel Convention, Annex II, Y46). At the Conference of the Parties to the Basel Convention at its twelfths meeting in May 2015, Parties agreed to include in the work programme of the Open-ended Working Group the development of a work plan on the environmentally sound management of household waste with a focus on the needs of developing countries and countries with economies in transition (BC-12/13). The work plan could include, but would not be limited to developing guidance documents and/or manuals on, inter alia, best practices, business models and innovative solutions for the circular economy in various socioeconomic contexts, as well as a concept for a partnership to assist municipalities. An Informal Group was established by the Conference of the Parties and it was tasked with the development of a work plan on the environmentally sound management of household waste for consideration by the Open-ended Working Group.